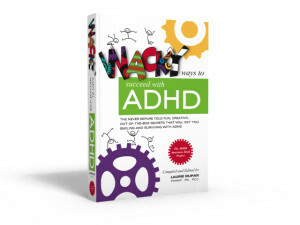 Sarah and I are very happy to be contributing authors to the ADHD Awareness Book Project’s Wacky Ways to Succeed with ADHD, joining other ADHD coaches and experts from around the world in sharing strategies, stories and tips to help people live well with ADHD. What I love about the idea of the book is the permission to find your own way to circumvent challenges, however “wacky” they might seem to someone else. It’s an invitation to experiment, play with possibility, and use the creative, out-of-the-box thinking that is so common to people with ADHD. Every person with ADHD has a unique combination of strengths, values, interests, and challenges. As people pinpoint what is getting in their way, they are one step closer to crafting personalized strategies that can help them work around things that do not come as easily for them. We learn from what didn’t work and we build on what has worked in the past, tweaking as necessary until we find something that allows our strengths to shine! And if the strategies stop working after a while, we figure out new ways to work more effectively, focus more easily, and keep starting on projects until they get done. One person might go to sleep in their workout clothes so that they are much more likely to exercise when they wake up. Someone else might program the coffee maker to brew at a certain time so they can gently awaken to the smell of coffee ready to be poured. We can get stuck in the shoulds, thinking “I shouldn’t have to do X, I should do Y.” But just because someone else does something a certain way doesn’t mean that we have to use the same strategy. We need to find out own, albeit wacky, ways that work for us. So experiment a little! Be creative! Find your own “wacky” but effective-for-you ways that help you live and flourish with ADHD! And if we can help you devise personalized strategies that work with your ADHD, feel free to contact us at Info@FocusForEffectiveness.com. It makes sense that every case of ADHD would be unique. I’ll make sure that my son gets the personalized treatment he needs! I’ll see if I can find my own way to help him. I’ll hire a professional if I can’t.